As I sat down to explain how it was that I came to my particular pathway, I realized many things one being that most of what has brought me here is the fact that I am deeply inspired by women who are following their hearts' calling, and if I were to list all the women who have inspired me over the years, there simply would be no room on this page. For you see my pathway lays in the heart of profound spiritual and devotional inspiration. I am inspired by the building up of others, and by women who are lighting their hearts on fire in order to pick up their medicine in this lifetime. My calling and gift is to support the lighting of these fires, and in the deep soulful exploration of the shadow realm in order to find our joy. My pathway here was a winding one, and although many parts were hard and rocky, I have always known that it was worth it at the time. I am fifteen, living on my own, no family, and a lost religion. Kicked out of both for smoking cigarettes. Although it would literally take 20 years for me to see it, I had been also kicked out for causing fear and uneasiness in the male elders of the congregation, yes my father was one of those elders. How did I do this? well for arguing on behalf of a feminine voice that does not exist in religion, being told to sit down and keep my mouth shut--so I did the next most reasonable thing--I opened my mouth and put a cigarette in it. On hindsight I realize that smoking was really just a way to be kicked out, so the choice would be made for me, because truthfully I was terrified. I terrified, because "that religion" was all I knew, and also because I felt a deep soul calling to a spiritual life, and I was not fitting into the one presented to me, but mostly I was terrified that there may not be anywhere else for me, a spiritual place to call home. And so it came to be that I would spend a good part of my lifetime alone, and searching for where I did fit. My journey into priestess work begin sometime in 1995 in Ontario with the creation of a triune of women seeking more than was currently offered in the mainstream world. We were a merry band of misfits in our early 20’s and 30’s knowing that there was something more, actively looking for it, reclaiming the word witch, and knowing deep down that this was exactly what we were, even though we had no older wise woman to guide us. At the time I had sort of been taken in by a first nations elder in my community who could see me floundering and lost, she knew my family and what had happened with regards to my lost faith. She was an Ojibway woman for whom I had known my entire life, and she offered me grounding and spiritual care. It was from her that I learned about the great circle of life, the elements of earth, air, fire, and water and their importance, and about deeper self care. Her guidance was a life changing gift to me, and I adored sharing her teachings to my sister friends as we burned the sage and sweetgrass that she gifted me each time I had a visit with her. However her ways were not for me to take, because as a white woman I had to find my own ways, my own ancestors and spirits, and it is this journey that propelled me to find my sense of place and belonging in the world. At this time I took solace in the many trainings I was learning, apprenticing as a doula, training in herbalism, aromatherapy and nutrition and yet still I felt a longing in my soul for more. I often said that I wanted to be standing at a bus stop and to have an older wise women come up to me and tell me that she saw my longing and would ask me if I wanted to train with her in the wise-woman ways. Alas, that never happened, and so, after what felt like many years of spiritual loneliness I took matters in to my own hands, and found a teacher with whom I could train with in the ways of the priestess. At the time I had no idea of the politics surrounding different types of pagan and wiccian trainings and I was protected by this with a teacher whose focus was in teaching me the basics of the Celtic wheel of the year; casting a circle, and learning deeply about the history of the ways of the divine feminine and it’s decline as patriarchy took over. I studied Marjia Gimbutas, Vicki Noble, Monica Sjoo and Elinor Gadon without the politics of labeling myself “pagan” or “wiccian”—this was pure education and personal empowerment and I loved it! Soon though, I began to feel a distinct dis-connect, and because I never joined the local pagan community, I felt lonely once again. Of course at the time I had a thriving doula practice, as well as teaching Birthing from Within classes and running a successful midwifery and home birth supply business, but still I was spiritually lonley…. At the time, doing this felt important, and I wondered if I would ever pick up my priestess work again. During these first precious years I learned so much about myself and about the shamanic ways of living, animism and the discipline required for this work. I was also able to take much needed time away from my busy family life in order to dive in as deeply as I needed to go. But then as the universe would have it, a few things happened. I met 2 women at a shamanic conference who both self identified as shamanic witches/ priestesses and both were working with a full shamanic practice. At the time I was blown away and it felt like a homecoming, and so I approached one of them at lunch time shyly telling her that I too was a priestess and asking her—how do you combine both of these modalities, because it seems like you simply can’t? What unfolded after this meeting was eventually to become a time of deep humbling for me, a few years of deep painful learning and loss. During this time I was still doing doula work, and it was here that I experienced my first baby loss, and it just happened to be one of my dearest friends and doula partner which added to my decision to stop doing birth work, which eventually led me to death doula work. This was followed a year later by losing something spiritually that I cared for a great deal, which in turn triggered a spiritual crises, calling me to question if I was really called to spirit work, and if all the time and effort I had put in was all for nothing? At it's deepest core though, this painful time was also the greatest gift I could receive, for it forced me to find my own authentic pathway. It also allowed me to realize that my guides were not going anywhere, and all I had learned was not for nothing--it just took time to see that. You see by this time I was also deep in the process of selling my business, I had stopped teaching both priestess work and working with doula clients, and I was following what I was sure was my authentic pathway, or was it? I was so filled with self doubt and longing my outward teaching voice was literally paralyzed. I was at a crossroads and I had no idea where I was to go. Fortunately for me, some good things were also brewing, as I was knee deep into the co-creation of our book Moon Mysteries and it was reminding me once again that the divine feminine resides so deeply inside of me that even when I thought I was "putting the work down" I was actually doing nothing of the sort. And then I remembered the invitation to apprentice with a new teacher I had received in the shamanic priestess realm, the same one I had met at the shamanic conference, a woman who eventually became the editor of our book, writing the forward for it, and supporting me continuously for years as I found my voice, and my eventual beloved shamanic community. Over the next 13 months I worked closely learning the ways of my ancestral lineage through the Celtic realm, and worked in service to both the divine feminine and shamanically. Yvonne initiated me through the tradition of the 13th house mystery school, and I then went on to become an elder priestess with her as my mentor, guide and friend. By then I understood just how deep my shamanic calling was, and my heart and soul longed for a deeper way understand all of it all. I knew I required deeper healing, and my guides urged me to find a teacher in this realm once again so I could complete my studies, which Is exactly what I did. 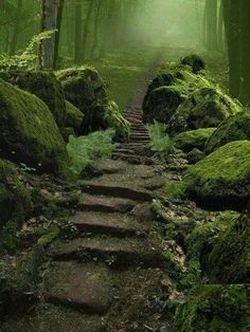 Doing deep journeywork with my guides I found where I was to be, and committed myself for another 3 years of apprentice to a specific tradition in Northern Celtic shamanism, one that hummed loudly in my ancestral veins. The deeper I got into my training, the more I knew in my bones that this was exactly where I should be, my spiritual loneliness was long gone, but to my frustration another kind of longing began, a knowing in my bones that something was once again missing. This time I knew exactly what it was. Each time I picked up spirit work, I deliberately put down my priestess work, and so I began to realize that before my shamanic initiation I had to do some journey work to see what I was being called to do, but if I am honest I kind of put it off--a LOT. And then I got the spider bite. Not just any kind of bite, but a necrotizing bite from a Brown Recluse spider that opened up a huge gaping hole on the back of my leg that took 3 months and high doses of antibiotics to heal. At the time I was knee deep into my initiation year, and my attention was being called into action—mostly because I had been avoiding it and discounting the various more subtle messages that were coming my way—so I suppose the bite was warranted to finally get me to pay attention. Without going into a years worth of intense shamanic work and initiation; I will share the part of it that is specific to my work with the divine feminine. In a shamanic journey I was shown myself in the middle of a pond, hopping on various stepping stones, but each time I would hop from one stone to the next I would totter and almost fall, each one of my feet was on a different path-a different stone, and I was never able to get both of my feet together. On and on the stones led, with no hope in sight of me finally reaching my destination, and with each jump I took I risked almost falling. I finally began to see that I was literally straddling two different paths and that this was no longer working for me. Finally exasperated I asked my guides-what do these two pathways mean? Instantly spider appeared, and then honey bee, each of them with a message. "You can no longer walk two different pathways, in order to initiate you MUST merge both of them, or fall off both of them forever." Stunned and overwhelmed at the simplicity of the message I said my thanks and bit my farewell, knowing that I had some changes to make. Two months later I was approached by a woman I knew quite well asking me if I would consider apprenticing her on the priestess path, without hesitation I told her yes, and asked her if she would be comfortable doing it shamanically. I explained that I would not be training her as a shaman, but that the only way I knew to go as deep as my offering required students to go, would be to work closely with the aid of guides…. A month later we slowly began, and two months after that I had another student, and then another and by the time of my initiation I was working this way with several students. I was called and I answered—my path awaited. At the time of this writing many years have gone by, and the creation of the Priestess pathway has been completed, poured over, and supported by both my shamanic community and my guides. I am no longer on two paths, but rather walking the one that I have been called to. This is my hearts offering, on my souls path…..